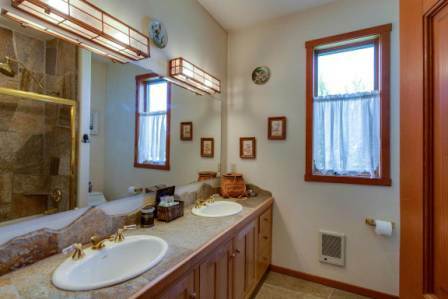 A pair of Vanity Lights VL101A Lg in Antique Copper with Seedy Glass in Bathroom of Rustic Wyoming Mountain Lodge. Hammerworks Early American Home Vanity Wall Light Small VL101 is a unique option for your bathroom. Most notably the singular style of these Colonial Wall Lanterns is similar in appearance to Antique Tin Ceiling Lights CL113. Therefore you can easily combine VL101 or VL101A with CL113 or Tin Ceiling Light With Seedy Glass CL114. In addition we handcraft the Colonial Ceiling Lights and Vanity Wall Light in your choice of copper brass or tin. Consequently not only do you receive a receive a solidly built wall light, but you can easily create a uniform look. Most of all the attractive design adds aesthetic value to any architectural room design. We offer several Traditional Wall Lantern Styles in addition to our primitive Early American Wall Lantern models. Whether you prefer antique copper Traditional Home Wall Lights or antique brass you can always count on our exceptional quality and value. Most importantly while we equip most of our Traditional Wall Lanterns with 2 candelabra lights, you can add a three or four candle option for extra illumination. Especially relevant each candelabra socket is UL rated for a maximum of 60 watts. Our extensive collection of Handcrafted Colonial Post Lanterns goes hand in hand with the Colonial Wall Lanterns. Several Colonial Style Post Light models correspond to a matching New England Traditional Wall Lantern. 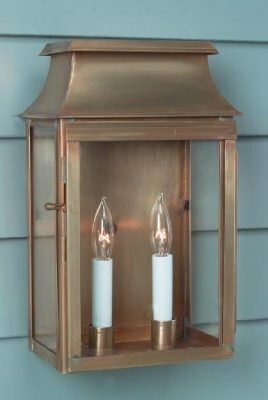 For example you can combine Cape Cod Copper Post Lanterns Pyramid PP119 with Colonial Home Copper Wall Light Pyramid W118. Whether you prefer a traditional style Colonial New England Style Copper Post Lantern or something a bit more rustic in appearance each Colonial Post Light is made with an industry standard three inch post fitter. Therefore you can choose from any of our Colonial Style Light Poles for your Cape Cod Post Lantern.